Food from the Mediterranean is what summer is all about. Fresh tomatoes, olives, feta or mozzarella cheese and big crisp salads served with crusty bread ( or the best available gluten free version), to mop up the dressing. On Saturday night I was doing my best approximation of a Greek feast, there were stuffed peppers and stuffed aubergines, a potato salad served with olives, capers and red onions, butterbeans cooked in a rich tomato sauce and a feta and tomato salad. While all this was cooking away I needed something for my guests to nibble on to keep body and soul together until dinner was served and I decided to try some Gluten Free Spanakopita. 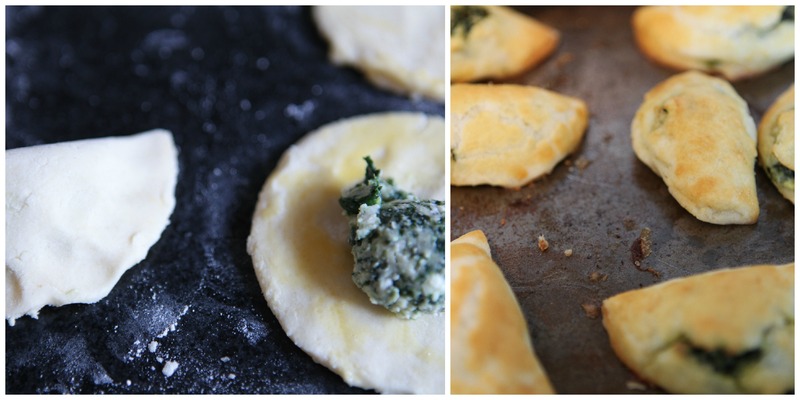 These little spinach and cheese pastries are usually made with filo pastry but I have never coma across a gluten free version of this so I had a look through the pastry recipes I have looking for something that was light and flaky and would suit the soft cheese filling. The combination of the two worked very well if I do say so myself and the pastry was so flaky and tender that a wee eight month old baby was able to gum her way through a whole Spanakopita quite happily. 1. In a bowl combine the flour, salt and xanthum gum. 2. Grate or cut in the cold butter and rub in to the flour until you get to the breadcrumb stage. 3. In a bowl mix together the water, lemon juice and sour cream and add enough of this liquid to the flour mix to make a soft dough. You may not need to use all of the liquid so use your best judgement. 4. 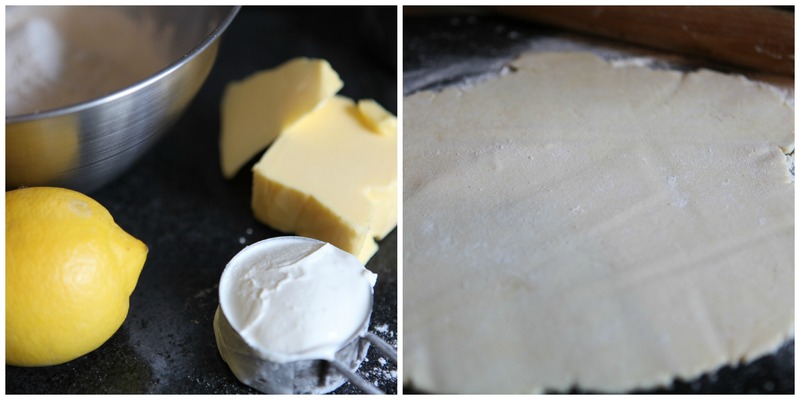 Wrap the dough in cling film and put in the fridge for at least an hour. I know you don’t normally need to rest GF pastry as there is no gluten in it but this is quite a soft pastry and it is easier to handle if it is cold. 5. When the dough is nicely chilled remove it from the cling film and place on a floured work surface. Roll the dough out to a thickness of about 3mm and using a pastry cutter or in my case a wine glass cut into 3” (7cm,)circles. 6. 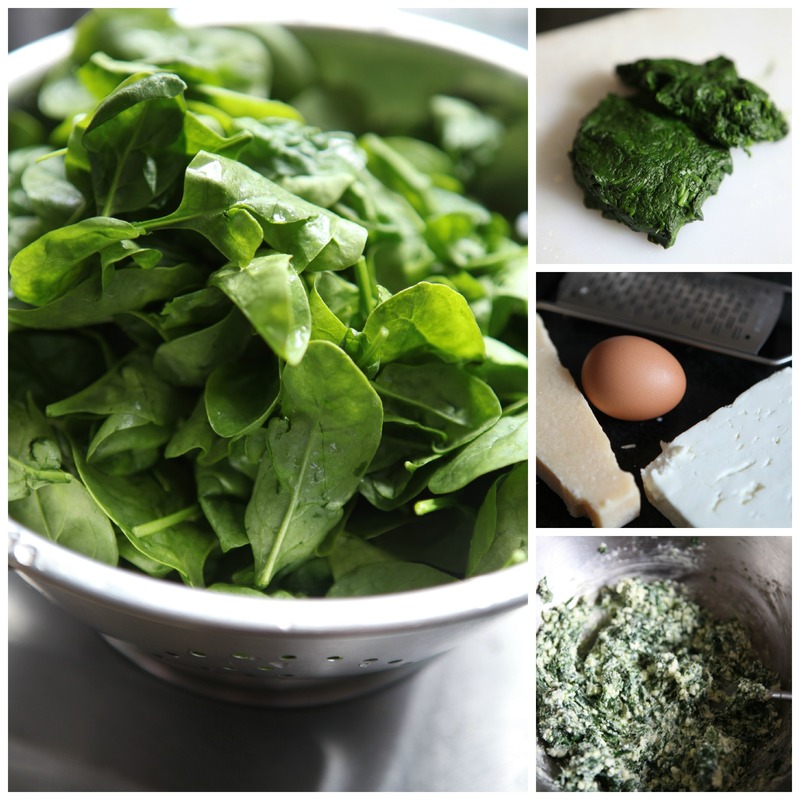 Brush the edges with egg wash and place a teaspoon of the spinach cheese mix on one half of the circle, fold over the other half and pinch the edges of the pastry to make a half moon shape and then brush with egg wash.
7. Place the pastries on an oiled baking sheet and place in an oven that has been pre heated to gas mark 4 / 180C. for 30 to 35 minutes until they are a nice golden colour. 200 grams of spinach, rinsed. 1. Put the wilted spinach in a pan and cover with a lid, cook over a low heat until the spinach is wilted. Drain in to a colander and when it is cool squeeze as much of the liquid from the spinach as possible. Finely chop the spinach. 2. Break the feta cheese in to a bowl and add the grated parmesan, egg and nutmeg. Mash this altogether with a fork and then stir in the chopped spinach. These little pastries are the perfect size to serve with pre dinner drinks or as part of a buffet and would also be great to pack as part of a picnic. They were gorgeous. And a great finger food for babies too! Only babies with excellent palates and adventurous parents!